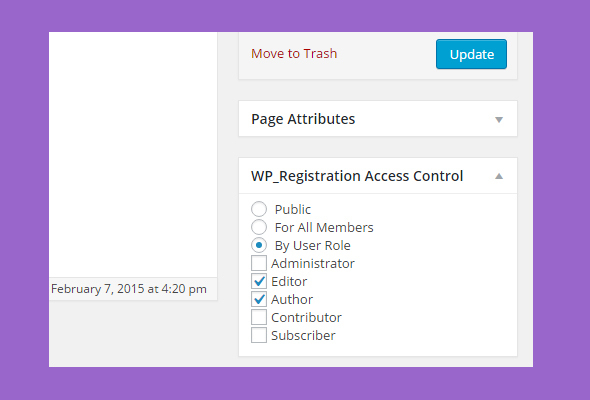 User can edit profile fields without accessing WP Dashboard. 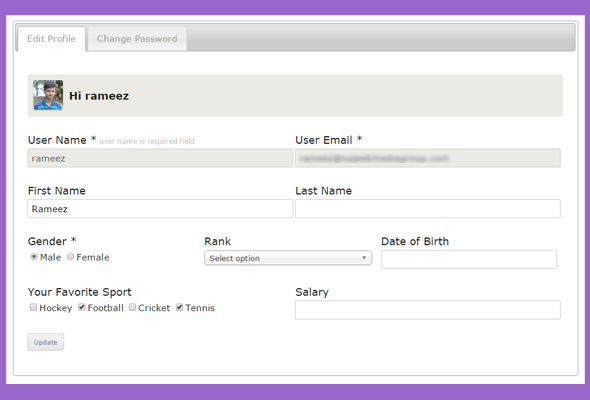 It renders a nice user area where all fields are rendered with password change option. Admin can also enable Auto Login option. It means that user is logged in right after registration process is completed and redirected to page set by admin. Users can signup/login with their Facebook,Twitter, Google LinkedIn and Envato accounts in one click. Just provide API keys and enable social login from plugin settings. Option added for users to type/choose their own password instead auto send. Role and Profile fields filtering. Enable/disable public view to directory page. You really don’t need to use another plugin for page restriction. 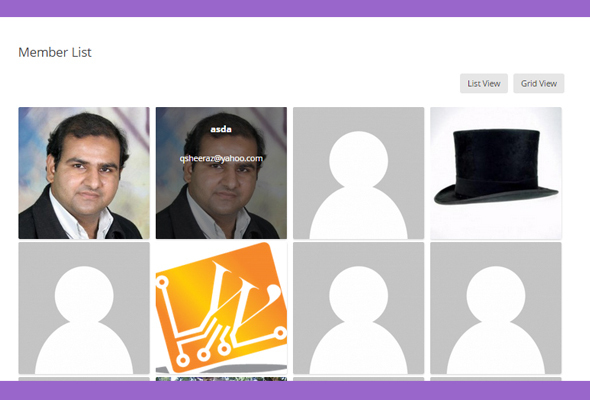 This plugin also handle page restriction by Role. Admin can control each page to be viewed only by specified roles and other users will see customizable message instead of page contents. Admin can also control user activation manually. User cannot signed in until admin approve it manually from settings. It’s not a mandatory part of this plugin it can be disabled anytime. Registration generated with this plugin fully responsive. We use Simple Grid CSS to render fields. To keep it easy for admin to design layout we have listed 1 to 12 columns as width option. 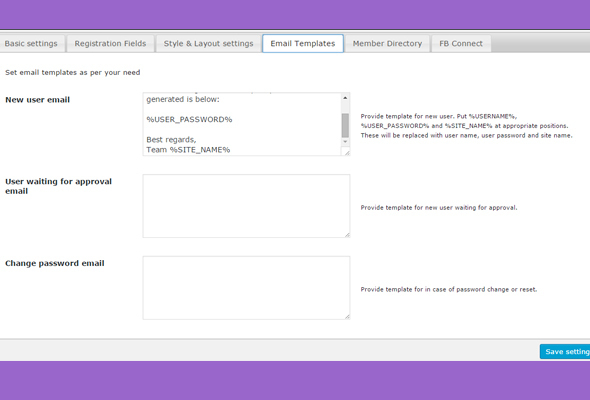 Email contents can be customized for new registration and password change. Set form labels, color and even with CSS editor you can add your own styles. How many signup pages can be created? Can user edit his profile from Frontend? Can we set redirect after login/signup? Can we register a member in certain Role? Bug Fixed: Logout URL was not working. Bug Fixed: Dashboard restriction was not working used spaces between roles, it’s fixed. Bug Fixed: User generated password was not working, fixed now. Bug Fixed: Password confirm field was visible, it’s now hidden. Bug Fixed: User meta was not adding on signup, fixed now. Bug Fixed: Some strings were not read for translations. Bug Fixed: Auto approved option not working properly. Bug Fixed: Page Access/Restriction options were not saving. Bug Fixed: Critical bug fixed generated in last update. Bug Fixed: Layout issue fixed while drag drop fields. Modify: wp_mail fail status issue. Feature: Awesome Email template added. Feature: Email template header option. Feature: Email template footer option. Bug Fixed: From Name text was trimming in email, now it’s fixed. 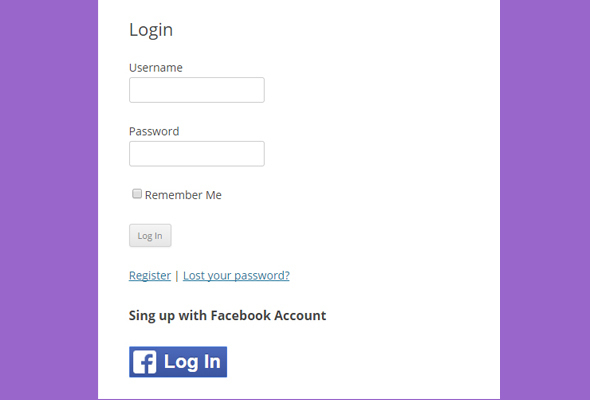 Bug Fixed: On login page user will not be redirected to WP Dashboard if wrong login found.